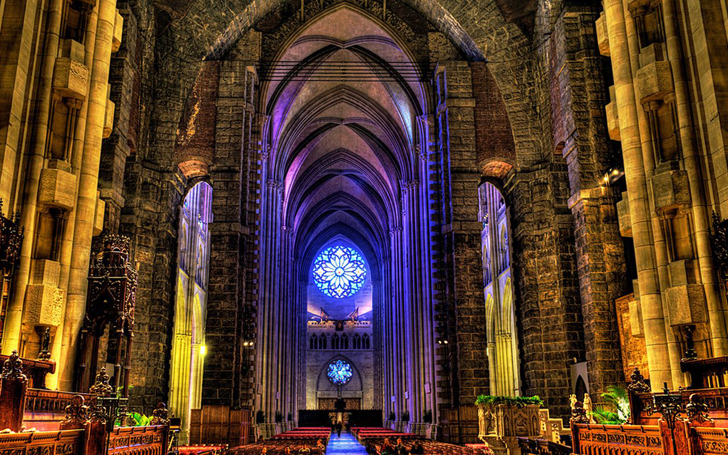 The Cathedral Church of St. John the Divine in the Upper West Side of Manhattan is the largest cathedral in the world. It is so massive, in fact, that the Statue of Liberty can fit inside. The diocese takes advantage of the cathedral's cavernous space through it's noted art exhibitions, the most recent of which examines one of the world most precious resources -- water. "The Value of Water" curated by participating artist Fredericka Foster, features pieces by some huge names, including Mark Rothko, Jenny Holzer, and Bill Viola, that spur conversation and contemplation about the global water crisis. You can check out the “The Value of Water” at St. John the Divine until March 25, 2012. Water is essential to human life. It has also been at the center of many of the world's conflicts -- disaster, drought, ownership and commodification. The six month exhibition serves as a reminder of social and civic service to better the planet. Reverend Dr. James Kowalski, Dean of the Cathedral says, "There’s nothing new about artistic engagement with water; what’s new is that we have reached a planet-wide crisis point in the availability of fresh water.” One must-see is Kiki Smith's Ten Elements of Dewbow. The teardrop shaped glass pieces represent dewbows, a rainbow formed in a sphere shaped droplet of dew that usually disintegrates when touched. It is a comment on the fragility of our relationship with water and how carelessly we handle it. In contrast, Nobuho Nagasawa's Bodywaves, a rocking chair covered in optical fabric channels our dependence on water. A recorded video of ocean waves plays upon a chair that senses human heat once it is sat upon and glows brighter with the interaction. Perhaps the most striking piece from the exhibition is Winn Rea's Fountain. Consisting of hundreds of sliced recycled water bottles, the spiraled pieces hang upside down like a cascading waterfall. The piece is both breathtakingly beautiful and painfully tragic as it reflects our incredible amount of waste production. Heavyweights like Bill Viola and Jenny Holzer point out the danger of ignoring water-related issues and natural disasters with the former's haunting Isolde's Ascension and the latter's striking declaration "You are so complex, you don't respond to danger" carved into a marble stool.